I can’t remember much of what happened pre-Wednesday this week. But Wednesday itself is a day I won’t forget in a hurry. Our current morning routine means Dollop and Mini get 15minutes of Cbeebies in the morning, whilst I have a shower. After that the news and weather go on, whilst breakfast is eaten. Both children have been fine with this routine, and sometimes Mini asks to turn the tv over (he’s learning which channel numbers are which). Wednesday was no different until it came to turning over. Mini and Dollop had already charged to the table and were halfway through breakfast when I realised Cbeebies was still on so I turned it over. All of a sudden, Mini charged at me screaming and shouting. He’d wanted to turn the tv over. Except he was eating his breakfast, and hadn’t asked to turn it over, but I should have apparently known anyway. The sofa was pulled to pieces; almost every single toy in the room ended up on the floor filling in the gaps between the sofa cushions; shoes were hurled at the window; the fireguard was pulled over sending the neatly stacked paperwork pile into the air like confetti; boxes of cars, happyland, instruments, plastic food was pulled out and emptied; children’s books provided stepping stones across the mayhem; mummy’s books were unceremoniously dumped in a heap; dining chairs on their sides made an impressive barrier between the living room and the kitchen, especially with the aid of a fully laden airer also on its side; a small heap of ironing (alright, a mountain but don’t tell anyone!) was distributed around the room and Mini even managed to pull a big heavy armchair across the room. Attempts to hold, calm, stop, and talk to Mini resulted in me being threatened with whatever he was about to throw, so with a crying, scared Dollop we just sat on the armchair and waited for the storm to recede. But at least Mini could see me and knew I wasn’t going anywhere. There was some self-control during this rage, as Mini definitely had second thoughts when it came to pulling the television over and pulling my Bridgewater china off the sideboard – thankfully! Then as suddenly as it started, it stopped again. Both children went back to the table, finished their breakfast and Mini got ready for school whilst Dollop packed her Happyland back in its box, and I put the sofa back together so we could at least cross the room and reach the front door. Nothing more was said. Mini went to school. Dollop and I came home and tidied all morning. The NC thankfully came home early to meet Mini from school, as I was terrified that things would reignite after school. They did, but in a different non-trashing-the-house way. This time Mini wanted everything NOW! A film, dinner, pudding, bath! Dinnertime came and when he'd eaten half his dinner, Mini then decided he didn't like it/wanted to be fed/was too tired/had itchy eyes/hated orange squash. Orange squash got thrown, food got spat out. Then he did want pudding/didn't want pudding, wanted to eat at the table/wanted to eat on the sofa. All of this was punctuated by LOUD screaming, thrashing, kicking and hitting. Bathtime was equally awful, did want a bath, didn't want a bath, Mini faked choking, was offered a drink, didn't want a drink, drink got thrown. Got in the bath, threw water over the entire bathroom (including me). Why? Well, Wednesday morning is when his usual teacher is out of the classroom, and he is greeted by Mrs Y instead. And they’ve been doing lots of practising for their upcoming sports day, and they’ve got ‘moving up’ day next week – events and occasions like these always throw him too. And I suspect the afternoon and evening trouble was because he was tired after the outburst in the morning, and because Daddy was there which upset his usual routine. This was one of those days were the trigger was unpredictable and completely unrelated to the underlying anxiety. It was impossible to avoid. Since that day, Mini has been much calmer. In fact, he was fantastic yesterday when he went to hospital with Daddy for his test results (read a bit more about the tests here and why here), and despite having to wait an hour for his appointment, he was polite, pleasant and playful. And this morning, despite finding out who his new teacher for Year 1 will be, and discovering which friends he’d be with and which he wouldn’t, he was still calm and went happily to school. Days like Wednesday make life hard. No don’t panic, this hasn’t happened…yet. But it is something I have worried about and have spent time considering. Mini's adoption was a UK domestic adoption. We adopted him through our local adoption agency/social services, and he comes from the same county as us. 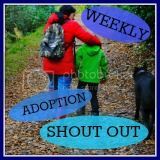 We only have limited letterbox (i.e written) contact with his birth family, and that is sent to/from the letterbox co-ordinator at the adoption agency so neither us nor the birth family knows each other's addresses. We live in a large town within our area, birth family live quite close by and would certainly visit our town to go shopping, to the cinema and similar activities. We know that birth mum has relationships with people who live here, some quite close. Of the few buses that operate between our town and where she lives, one of them passes *very* close to our house, and it often passes me when I’m out and about with the kids. On top of that, she knows what town we live in. A few years ago when Mini was still in a pushchair, I had a major panic as I was convinced that birth mum had just passed me on the bus and had seen and recognised me. (We have met birth mum, so it’s a possibility…I haven’t changed much since then). I legged it home as fast as I could, shut the curtains, locked the door and phoned hubby. Then I waited for someone to knock on the door. The knock, thankfully, never came. I still don’t know if it was her, but I’m 90% sure that it was and I hope I never have to experience that panic again. Knowing that it’s quite likely birth mum comes into our town, I must admit that I don’t hang about when I need to go into the town centre, although I’m not really one for traipsing around the shops for hours on end anyway. I only tend to go with Mini if the NC and Dollop come too (they’re my ‘security’), otherwise it’s usually just me and Dollop during the week. I had thought about pimping Dollop’s buggy with spikes and the like so I can take out ankles if we are approached, but I think that might invalidate the guarantee! I do have a loose plan too – lock self and children in a changing room such as M&S, immediately ring hubby, and if under threat – police too. Now, years down the line, I’m less worried about it happening. I am Mini’s mum and I will protect him fiercely. I would have always fought for him and never let anyone take him, but in those early days I think I would have found the confrontation much harder and I wonder what the after effects of such an event would have been. These days, woe betide anyone who tries to get in between us. Emotionally I’m much stronger and could cope (for both of us) better. I would also like to think that after all this time, Mini's birth mother could now recognise that he is settled (ish) and happy here.